With Virtual Reality on the rise, we see plenty of powerful VR headsets like the Samsung Gear VR that's made to turn heads (literally). But what about creating VR content for these devices? 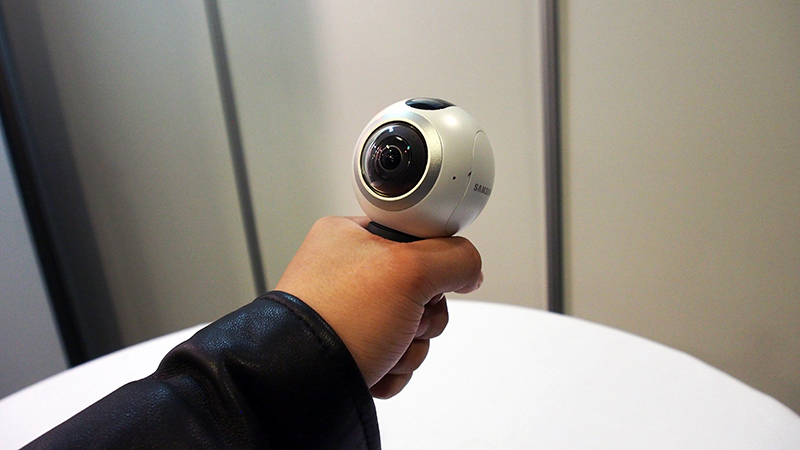 At the pre-MWC 2016 Samsung event, they showed us the Samsung Gear 360. It's their answer to bringing us an everyday person's portable VR camera for creating immersive VR videos and stills. 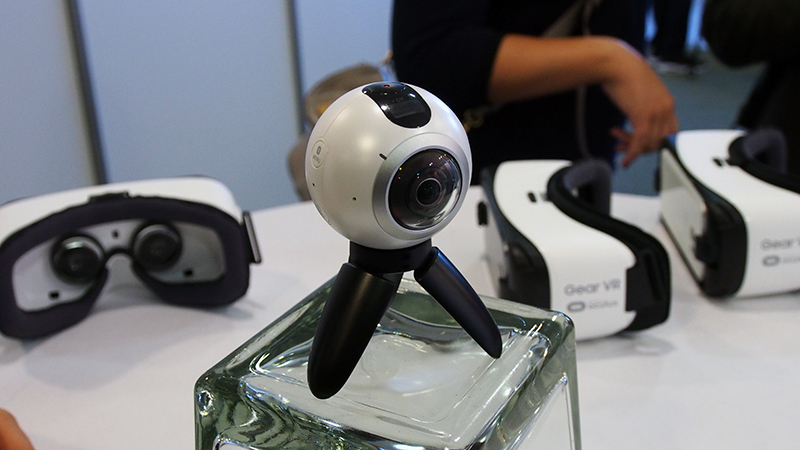 The Korean electronics giant didn't share that much about the new device, but we got a taste of how the Gear 360 will serve VR adopters. 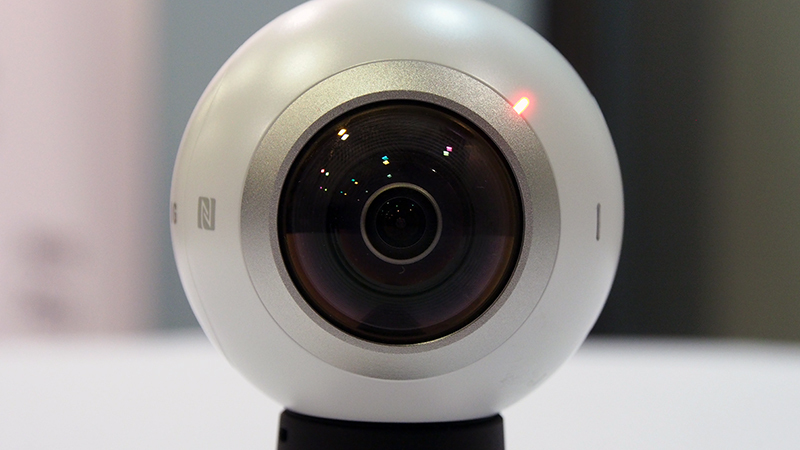 The Samsung Gear 360 comes with two CMOS 15-megapixel fish-eye cameras, located on opposite ends of the orb-shaped structure at the top of the device. Footage and images captured by the Gear 360 are processed by its in-built DRIMe 5s image processor - we think that's the same class (but different version) of image processors found in their Samsung NX1 and NX500 mirrorless cameras. To be clear, the NX500 lists their image processor as "DRIMeV", whereas the Gear 360's was listed simply as “DRIMe5s”. It records videos in MP4 (H.265) format, and the dual lens combo will give you 3,840 x 1,920 pixels resolution at 30 frames per second (FPS). 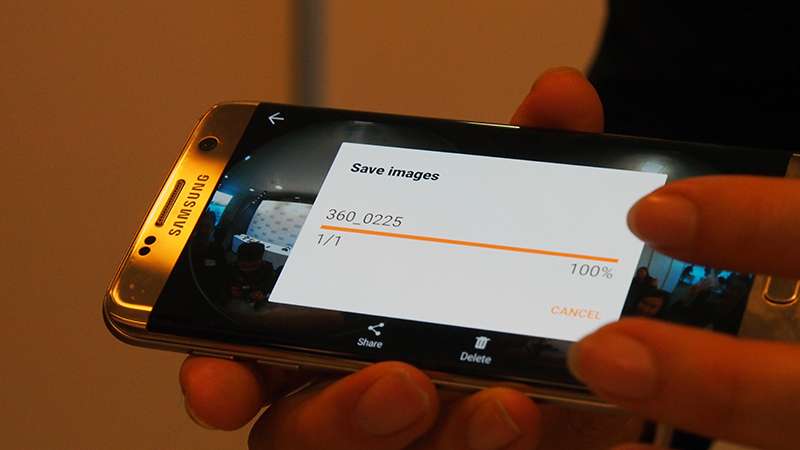 Images are in JPEG format, totaling 30-megapixels in 7,776 x 3,888 pixels resolution. It records audio too (MP3, M4A, AAC, and OGG formats are supported). The tiny little display at the top is a 0.5-inch PMOLED screen at 72 x 32 pixels resolution, which is strictly for reporting the status of the Gear 360 (such as its remaining run-time and battery levels). 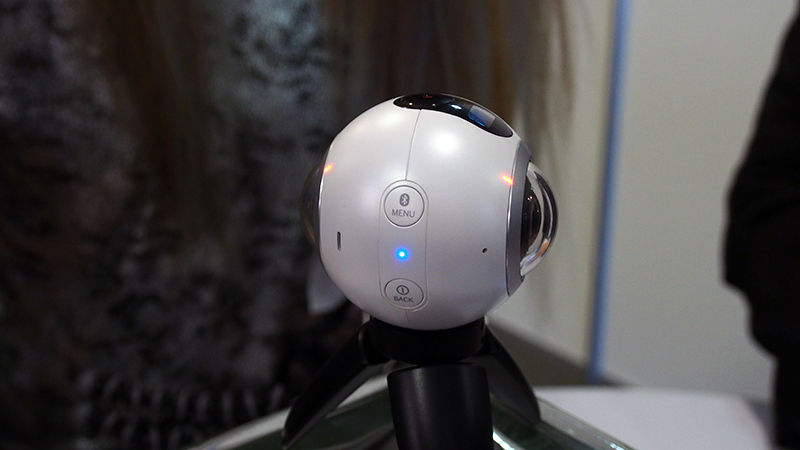 You can turn on independent lenses on the Gear 360, and the camera will indicate active lenses using a small orange LED on its respective side. It uses a removable 1,350mAh Li-ion battery, and storage space is taken care of via a MicroSD card (up to 128GB). 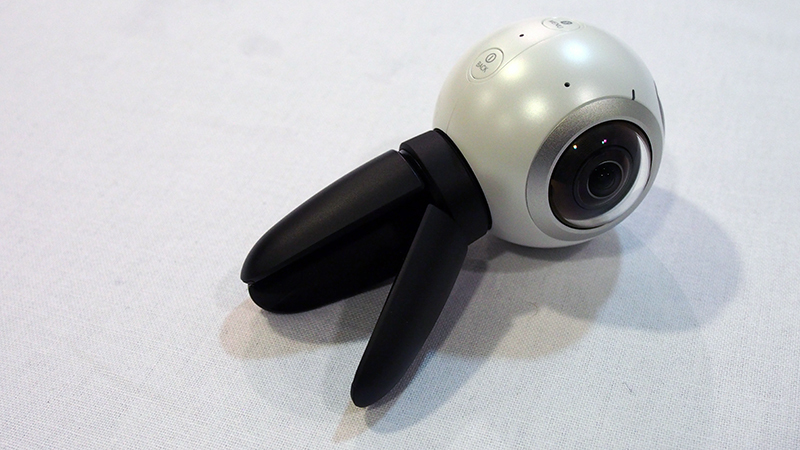 The Gear 360 is also compatible with various connectivity methods - WiFi 802.11 a/b/g/n/ac (2.4/ 5GHz), WiFi Direct, Bluetooth v4.1, USB 2.0, NFC. 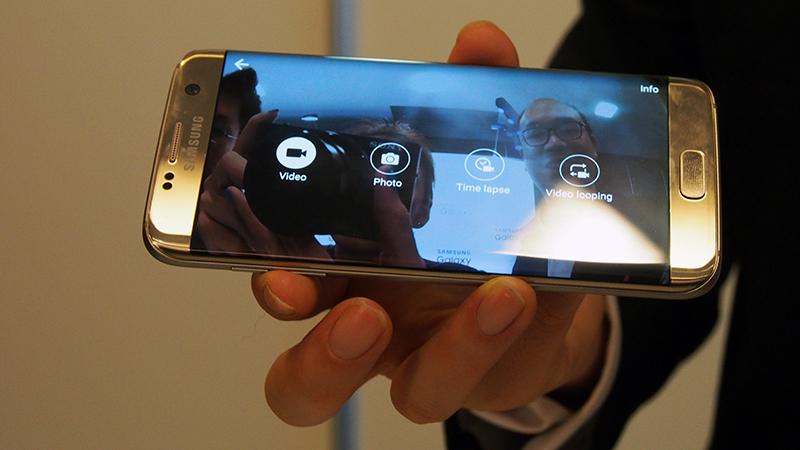 The entire device is just 66.7 x 56.2 x 60mm, and it weighs 153g with its battery accounted for. 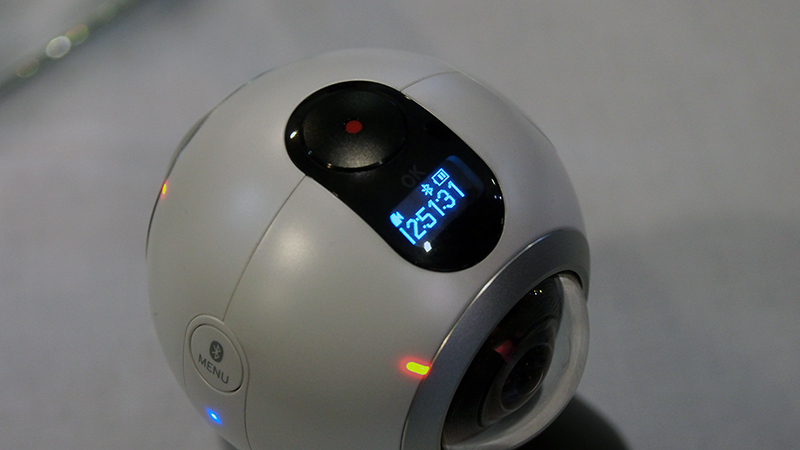 The Samsung Gear 360 itself has IP53 Certified resistance to dust and water. 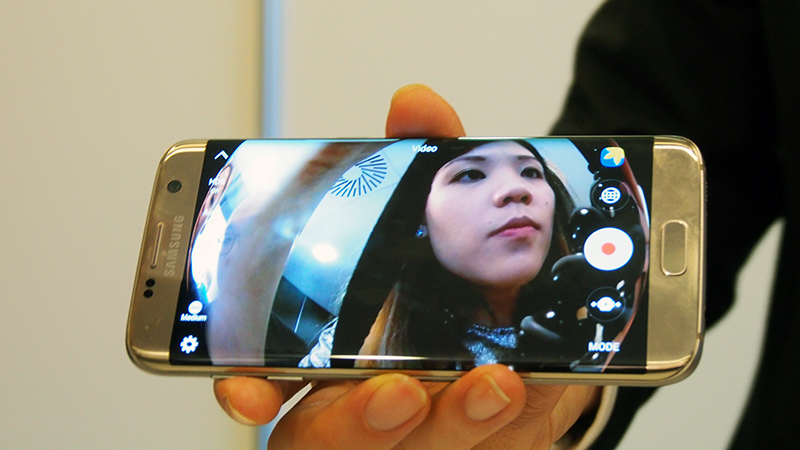 To use Gear 360, the user will need a Samsung phone with the Samsung Gear 360 app. 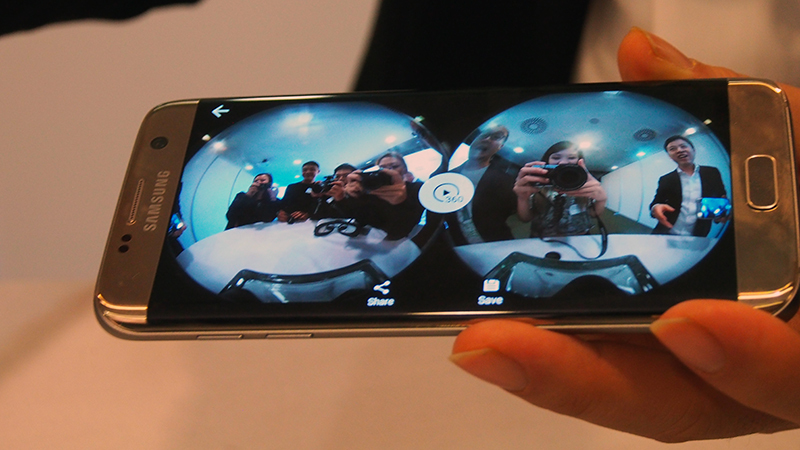 Once paired, the phone will be responsible for monitoring and controlling the images and videos captured on the device, and it will also stitch your VR images and footage into a coherent copy (traditionally, such stitching technology requires a full desktop to accomplish). 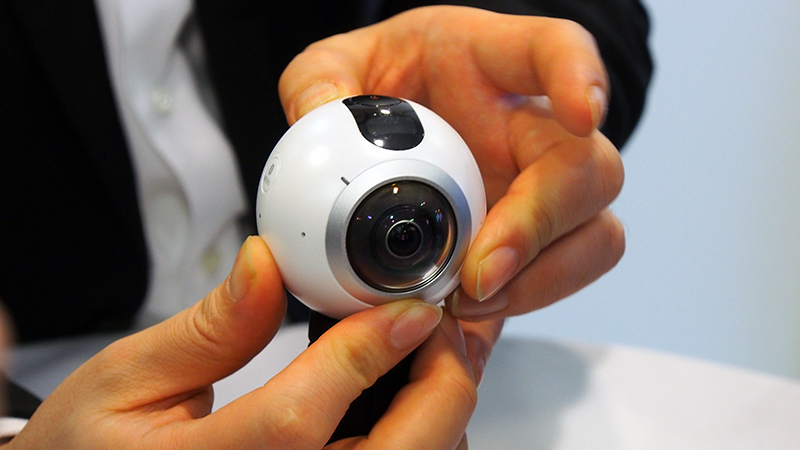 Footage recorded into the Gear 360 can then be transferred to the smartphone over the air. 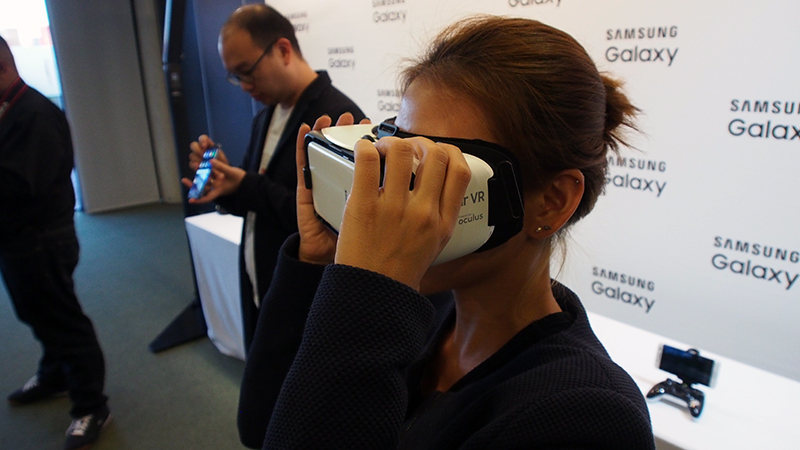 Once the footage or image is created, the user can interact with the final VR product via the Samsung Gear VR headset. Our experience was comprehensive - once the footage is ready on the phone, we simply mounted the smartphone on the Gear VR headsets available, and donned the headsets to witness our self-created content. 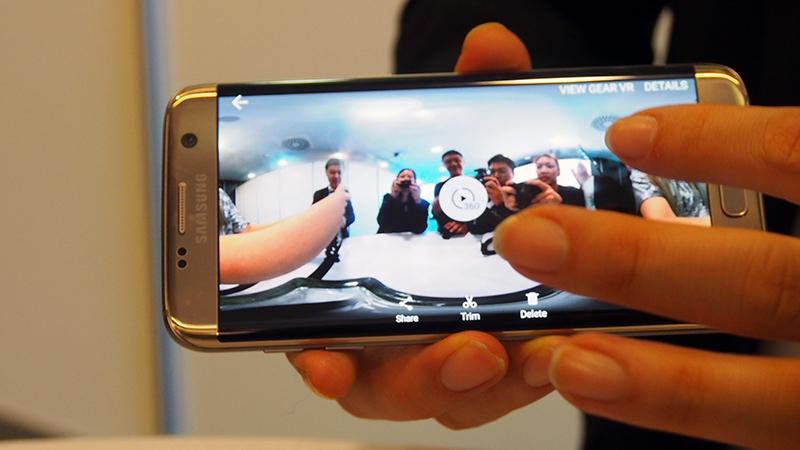 With a Samsung smartphone, you can share your created VR content to social media, such as Facebook, YouTube, and Google Street View. 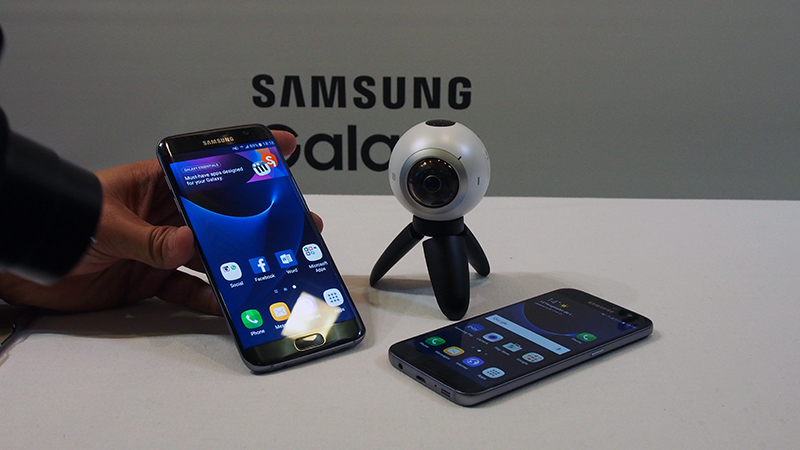 The VR camera is currently compatible with select Samsung smartphones - the new Galaxy S7 and Galaxy S7 edge, Galaxy S6+, Note 5, Galaxy S6 edge and Galaxy S6 - with no official news on other compatible smartphones. 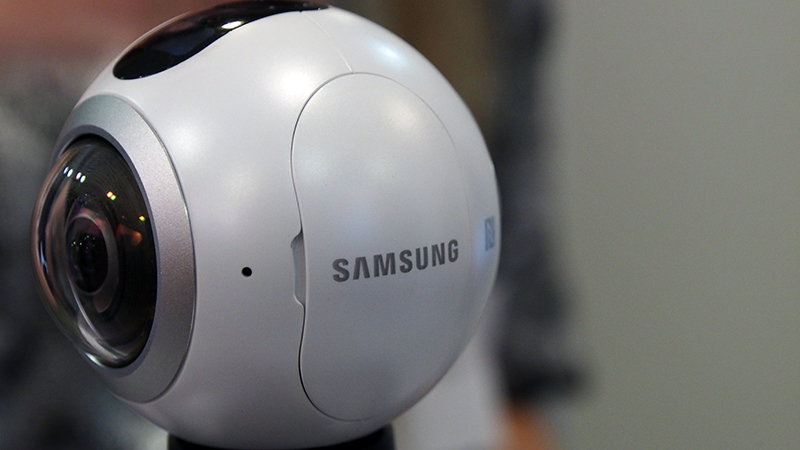 The Samsung Gear 360 will be available in select countries come Q2 2016.